"Gold Star public relations is above and beyond. The friendly good tempered helpful staff is always willing to help customers with unexpected problems that may arise"
Mercedes TX is known as "The Queen City of the Valley" or "La Reina del Valle". The city of Mercedes was founded September 15, 1907, by the American Rio Grande Land & Irrigation Company, and was incorporated March 8, 1909. It is one of the oldest towns in the Rio Grande Valley. The city of Mercedes Texas offers easy access to the Weslaco Bicultural Museum which features exhibits on the history of the Weslaco and Rio Grande Valley, and the International Museum of Art & Science which houses collections of fine art, and Latin American folk art. Port Isabel Lighthouse State Historic Site, which marks the site of a lighthouse constructed in 1852, is of historic significance. Opportunities to play golf are available at the Llano Grande Country Club, and The Palms at Mid Valley. Visitors can enjoy fishing, boating, hiking, camping, and picnicking at the Bentsen Rio Grande Valley State Park. Residents of Mercedes also organize annual events like the Passport Fair, Texas Street Festival, and Rio Grande Livestock Show & Rodeo. 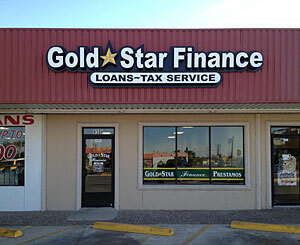 Gold Star Finance is proud to be a part of the vibrant Mercedes community, proving short term consumer loans within the Mercedes TX area. Stop by location on West 2nd Street so we can get to know you better. You will always be treated with courtesy and respect at Gold Star.